Henderson Auctions in conjunction with Bonnette Auctions, is proud to offer at Public Auction this exceptional Industrial Facility. Call 225-686-2252 to set up phone bidding or pre-bids. Building is approximately 5 years old and appears to be in excellent condition. 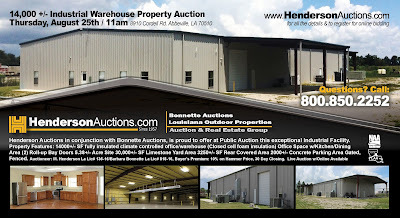 www.HendersonAuctions.com for all the details and to preview all our other upcoming auctions!